Save time, money, and your back... 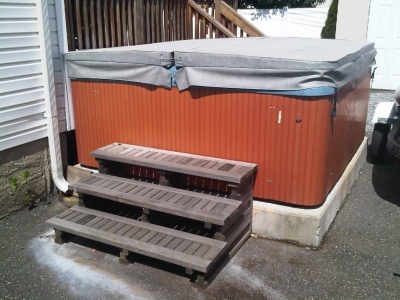 Removing even the largest appliances, like this hot tub, is a breeze when you call 1-855-F'IN-JUNK. Got old or a broken-down appliance taking up space? We'll get them out fast! When it's time to replace that old washer, dryer, or water heater, you may be left wondering how to get rid of it. You can't dump it just anywhere, and it can be a major challenge just to get it downstairs and out the door. 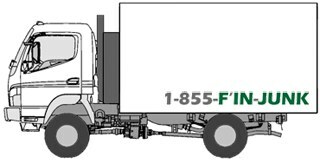 That's where 1-855-F'IN-JUNK comes in. We'll pick it up wherever it's sitting right now and get it hauled away fast. Just give us a call, and our professional junk removal team will do all the heavy lifting! How much will it cost to recycle my appliance? Junk removal prices are determined by volume. If you know the approximate size of the appliances that you need hauled, you can get a ballpark estimate by checking our junk removal price chart. How do I schedule an appliance pickup? Scheduling a pickup for your junk appliance is easy, and only takes a minute!